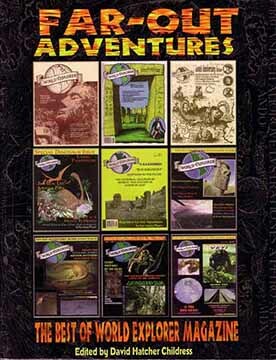 This is a compilation of the first nine issues of World Explorer in a large-format paperback. Authors include: David Hatcher Childress, Joseph Jochmans, John Major Jenkins, Deanna Emerson, Katherine Routledge, Greg Deyermenjian, Dr. Marc Miller, and others. Articles in this book include Smithsonian Gate, Dinosaur Hunting in the Congo, Secret Writings of the Incas, On the Trail of the Yeti, Secrets of the Sphinx, Living Pterodactyls, Quest for Atlantis, What Happened to the Great Library of Alexandria?, In Search of Seamonsters, Egyptians in the Pacific, Lost Megaliths of Guatemala, the Mystery of Easter Island, Comacalco: Mayan City of Mystery, WEX Remembers, comix, odd-ball adverts and plenty more. A massive, large-format book. Autographed on the title page by David Hatcher Childress. FAR-OUT ADVENTURES AUTOGRAPHED EDITION: The Best of World Explorer Magazine Edited by David Hatcher Childress. 520 pages. 8x11 Paperback. Illustrated.